Today we’re asking the question, “How is one saved from Hell and allowed in Heaven?” When we tell people salvation is a free gift, some think it’s too good to be true. They figure they must earn their way to Heaven by living according to some rules and avoiding serious sins. They can’t imagine God giving us His blessing, the forgiveness of our sins, and a home in Heaven just by believing in Jesus Christ—whatever that means. Perhaps you are one of those people. The word grace (in Greek charis) means "favor." One who has the love, blessing, and favor of another may be said to be in the "good graces" of his benefactor. The distinguishing factors of God's grace are twofold: first, God's grace is a gift and is unearned; and second, God's grace is undeserved. Usually, we think of having to earn a place of favor with others, but God gives us His favor as a gift. That is why no one, regardless of how sinful they are, is out of the bounds of God’s grace. The only sin that cannot be forgiven is blasphemy against the Holy Spirit, which is unbelief. The Holy Spirit’s job is to convict one of sin and present Jesus Christ as the atonement for sin. If one rejects this work of the Holy Spirit as false, which is blasphemy, there is no forgiveness, because one must have faith in the Lord Jesus Christ to receive grace. God accepts, loves, and blesses the person who stands in His grace. Even though we, who believe, deserve to be punished for our sins, God mercifully forgives us when we believe in His Son, repent, and are baptized into Christ. In Christ, we are forgiven, we become new creatures, born of the Holy Spirit, transformed into the likeness of Christ, and transferred into the kingdom of God, all by the grace of God. We cannot do these things for ourselves, nor can we earn them through moral behavior. Grace is not a wage for our labors, nor an award for our meritorious efforts. Grace is a gift. We receive God’s grace out of His love and mercy, because Jesus Christ has atoned for our sin by taking our punishment on the cross. Jesus has saved us from Hell and damnation and enabled us to receive God’s grace to enter Heaven. Ephesians 2:1-10 As for you, you were dead in your transgressions and sins, in which you used to live when you followed the ways of this world and of the ruler of the kingdom of the air, the spirit who is now at work in those who are disobedient. All of us also lived among them at one time, gratifying the cravings of our flesh and following its desires and thoughts. Like the rest, we were by nature deserving of wrath. But because of his great love for us, God, who is rich in mercy, made us alive with Christ even when we were dead in transgressions—it is by grace you have been saved. And God raised us up with Christ and seated us with him in the heavenly realms in Christ Jesus, in order that in the coming ages he might show the incomparable riches of his grace, expressed in his kindness to us in Christ Jesus. For it is by grace you have been saved, through faith—and this is not from yourselves, it is the gift of God—not by works, so that no one can boast. For we are God’s handiwork, created in Christ Jesus to do good works, which God prepared in advance for us to do. 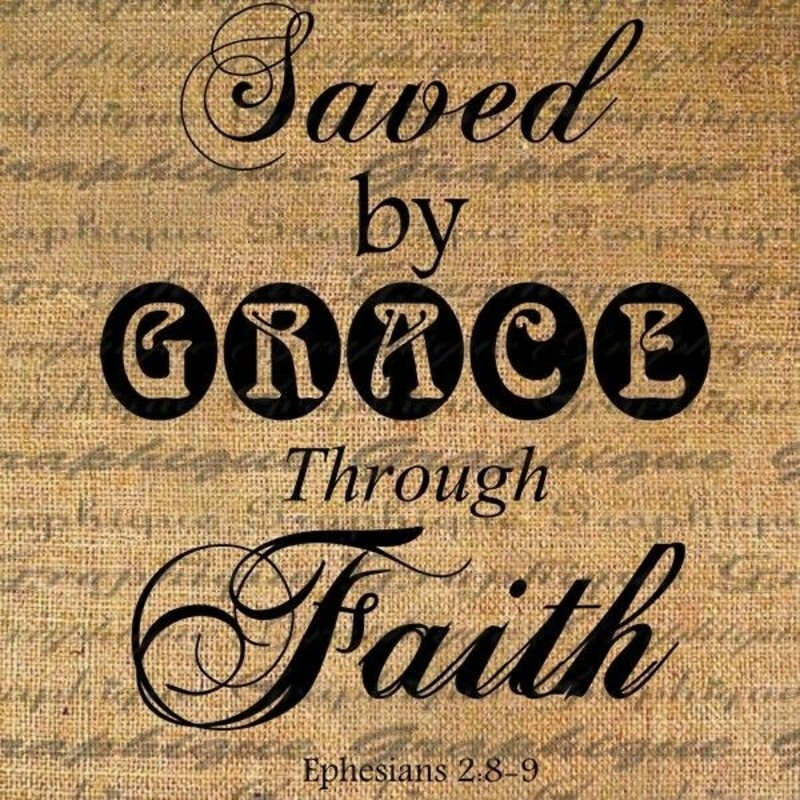 We’re saved from Hell and allowed in Heaven by grace through faith in Jesus Christ. It takes both. 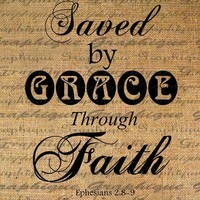 We’re not saved by grace alone nor by faith alone, but by grace through faith. Grace reflects all that God does in our lives to bring us home to Him. Faith reflects our response of trust and love and obedience to the grace that He’s given us. God’s grace works through faith in Jesus Christ. Faith is not head knowledge. Faith responds to God’s grace by believing in the work of Jesus Christ and by obeying His Word. By faith in Jesus, we confess and repent of our sin. God chose to wash us and give us a new birth by the Holy Spirit through baptism. The life we live after baptism is a daily death to our sinful nature, and walking in obedience to the Holy Spirit, who leads us to do good works. Galatians 3:26-27 So in Christ Jesus you are all sons of God through faith, for all of you who were baptized into Christ have clothed yourselves with Christ. We are sons of God by faith in His Son, Jesus Christ, but this is a faith that will repent and be baptized. For it is in baptism that God causes us to be born again and we “put on Christ.” Baptism is not some work that we do to earn salvation. It’s how we obey God in faith, because He asks us to be baptized. Even Jesus, who had no sin nor any need for salvation, submitted to baptism in the Jordon River to fulfill all righteousness; in other words, to obey what was right according to the Father. He set an example for us to follow. Now obedience is not the same thing as earning. Let’s say I had a bank account worth $10,000. And I told you that I would give it to you, provided you go to the bank to withdraw it. First of all, would you believe me and do it, or would you consider such a gift too good to be true? If you believe me, do you really think that the few minutes of withdrawing the money from the bank is the same as earning that $10,000? No, you didn’t earn the gift, you merely received it by believing me and doing what I asked you to do. And that’s how it is in salvation. We don’t earn salvation by repenting or being baptized. We merely believe what Jesus has said and in what He has done to save us, and we comply with His conditions for receiving His gift of grace. For a better example, we can refer to John 9:6-7. Jesus wanted to heal a blind man, so He spat on the ground and made some mud out of the dirt. Then He applied the mud to the blind man’s eyes. (How might one react to this?) Then Jesus said to him, “Go, wash in the pool of Siloam”. So he went away and he washed, and he came back seeing! The blind man earned nothing, but he believed Jesus strongly enough to do what Jesus told him to do, regardless of how embarrassing or gross it may have seemed. Faith is not merely accepting a command as true. It is trusting enough to do what Jesus tells us to do! Let me make it very clear that baptism is NOT how we earn salvation. Baptism without faith and repentance does not generate grace for salvation; it is just getting wet! That is why infant baptism does not save us, for the infant has no faith or repentance. We cannot be saved by someone else’s faith and obedience. Grace is given to the individual who has faith in Jesus, repents of his old life of sin, and is baptized. Nevertheless, the Bible does teach that baptism, following faith and repentance, is necessary to salvation—just as washing in the pool of Siloam was necessary to receive sight. These are God’s conditions, not ours. He gave them to us, we didn’t make them up ourselves. If we really have faith in Jesus, we will follow His instructions to repent and be baptized. For example, Paul and Silas were unjustly whipped and imprisoned. However, their testimony while imprisoned, and the miraculous demonstration of God’s power causing the chains on Paul and Silas to fall off them, prompted the jailed to cry out, “Sirs, what must I do to be saved? Acts 16:29-34 The jailer called for lights, rushed in and fell trembling before Paul and Silas. He then brought them out and asked, “Sirs, what must I do to be saved?” They replied, “Believe in the Lord Jesus, and you will be saved—you and your household.” Then they spoke the word of the Lord to him and to all the others in his house. At that hour of the night the jailer took them and washed their wounds; then immediately he and all his household were baptized. The jailer brought them into his house and set a meal before them; he was filled with joy because he had come to believe in God—he and his whole household. Faith in the Lord Jesus Christ and obedience to His call to be baptized, initiates God’s grace for our salvation. We don’t deserve salvation and we can’t earn it, but God gives it to us through faith in Jesus Christ and His work on the cross. Out of God’s love and mercy, He gives us His grace when we have faith enough in Jesus Christ to repent and be baptized. We must never cheapen or presume upon God’s grace. People presume on God’s grace by changing the conditions or by setting those conditions for salvation aside. They presume God’s grace is given whether they obey Him or not. Only God can make exceptions for receiving His grace—if He chooses to—when the conditions are impossible for man to meet (i.e. the thief on the cross could not be baptized). God may choose to make exceptions for infant deaths and death bed conversions, but we cannot presume these things for ourselves. God is the only judge and giver of grace, and we must leave the exceptions to Him. For those of us who have an opportunity to receive His grace through faith in Jesus Christ, His conditions are well defined. Refusing to meet God’s conditions or choosing another way for ourselves, does not demonstrate faith in Jesus, but faith in our own religion! As a result, we do not receive God’s grace for salvation. If he really wanted to see, do you think the blind man would have argued with Jesus to receive his sight his own way, instead of having spit and mud on his eyes and washing in the pool of Siloam? Why then does anyone argue about repentance or baptism being necessary for salvation, if they really want to be saved? Wouldn’t it be better just to trust God and obey Him rather than take chances with our eternal life? The New Testament is the new covenant of our Lord and Savior Jesus Christ. This new covenant contains what God promises His people and what God expects of His people. In this covenant, God is the benefactor who gives more grace to us than can ever be repaid or earned. If we count our blessings, such as salvation, continued forgiveness of sin, eternal life, the right to pray and be heard, son-ship, and intimacy with God, we could never repay Jesus for what He has done for us. He doesn’t expect repayment! He expects love, loyalty, and obedient faith. Now faithful obedience is not some form of legalism, nor is it a way to become righteous. Our righteousness comes by grace through faith in Jesus Christ. Obedient faith is love. We obey God because we love Him. We obey because we desire an intimate love relationship with Him. When we love the Lord and we want to please Him, we’re willing to do everything He asks and do it the way that He wants it done. And we won’t argue with Him about it. So, when the Lord asks us to believe, we’re willing to trust Him and His Word completely. When the Lord asks us to repent of our sins, love for Jesus Christ turns us away from sin that offends God. Love cannot imagine continuing to offend the Person who’s been so gracious to us and loves us. When Jesus asks us to confess Him before others, we’ll gladly say to the whole world that Jesus Christ is the Son of God, King of Kings, Lord of Lords, and the soon coming Messiah! When we believe the Lord and desire His salvation and His life, we don’t question the conditions to receive His blessings and grace. He is worth more than our sin and our pride. He is worth repenting of sin, making a public confession, and being baptized by immersion. Heaven, eternal life, the gift of the Holy Spirit, forgiveness of sin, intimacy with God, peace, and joy are just some of the blessings of God that we receive by His grace. Titus 2:11-14 For the grace of God has appeared that offers salvation to all people. It teaches us to say “No” to ungodliness and worldly passions, and to live self-controlled, upright and godly lives in this present age, while we wait for the blessed hope—the appearing of the glory of our great God and Savior, Jesus Christ, who gave himself for us to redeem us from all wickedness and to purify for himself a people that are his very own, eager to do what is good. God’s grace is not a one-time gift. After baptism, God’s grace guides us by His Word and the Holy Spirit throughout our life, purifying us and preparing us for Christ’s return! While we wait, we are eager to do what is good. Are you getting ready for Jesus’ return by obeying His Word? Are you receiving grace daily through the Holy Spirit and being led by Him? If not, it may be you’ve wandered away from God and you need to come back to Him. Let God’s grace back into your life by confessing your sin, repenting, and asking for the Holy Spirit to give you His grace again. If you have never had a close, loving, intimate relationship with God, you can start one today. Believe in the Lord Jesus as the Son of God and the atonement for your sin. Then confess and repent of your sin. Step out and confess in faith before others that Jesus Christ is the Son of God and you are ready to die to self by being baptized to receive God’s grace and salvation. You will be born again of the Holy Spirit, and He will lead you to live a new life of faith and intimacy with God. As a result of your faith in Jesus Christ, you will be saved by God’s grace from damnation in Hell and allowed to live eternally in Heaven as His child.